4th of July Crafts | Learn to make great 4th of July Crafts. Easy 4th of July Crafts - You can Make TODAY! 4th of July crafts can make for a great Independence Day! Make this flag pin for yourself and friends! The fourth of July is filled with summer fun and summer crafts, there are so many things you can create using the colors red, white and blue. If you have 4th of July crafts that you would like to show on our site, visit our submissions page and show us your Independence Day craft ideas and projects. We will gladly put your 4th of July crafts right here with the others. Remember to include photos with your submission. Go ahead and click on one of the projects below and get started. 4th Of July Crafts- It's Summer Craft Time Fun! You could easily create a cute bowl of these treats to either put out for the picnic or you could put them out on your desk at work. What else could be better than making your own festive summer party treats and favors? Well, of course there is the swimming fun of summer and we will be adding a number of summer craft ideas too! 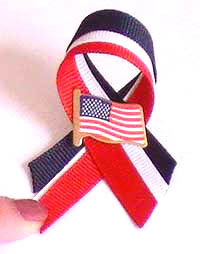 How about showing your patriotic spirit with one of these flag pins? The are super easy to make. 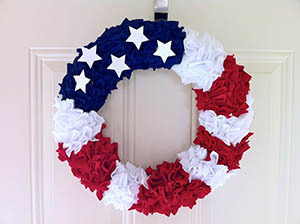 Imagine having one of these beautiful patriotic wreaths hanging on your front door! Love this one, but there are 12 to choose from. If you have a particular request for a project not listed below yet, email and let us know what you would like to see on these pages. We are currently looking for summer crafts and ideas, back yard ideas, so if you have unique ideas feel free to send them to us so we can take a look. We have also started something new! We now will include places where you can find the same products that we are using in our craft projects. So, be sure to visit thes areas when you see them. We don't have them up on every page yet, but we are constantly working on the site to bring you the best project and products! 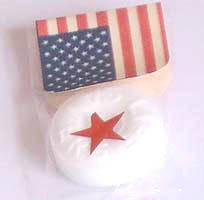 Again, thanks for visiting our 4th of July Crafts Projects page!